Northwest Bifolds offer AluK bifolding doors as an alternative and additional bifolding door that has been added to our extensive product range. The AluK door is also one of the best selling aluminium bifolding doors in the UK and offers you further choice in folding doors. We have specially selected our the AluK bifolding door as yet another slimline door that comes with a choice of profiles to create either a traditional or contemporary looking door. It offers excellent specifications, great design, wide colour choice and is flexible and adaptable. Let Northwest Bifolds hope you create a new room, a new entertaining space and add value to your home. 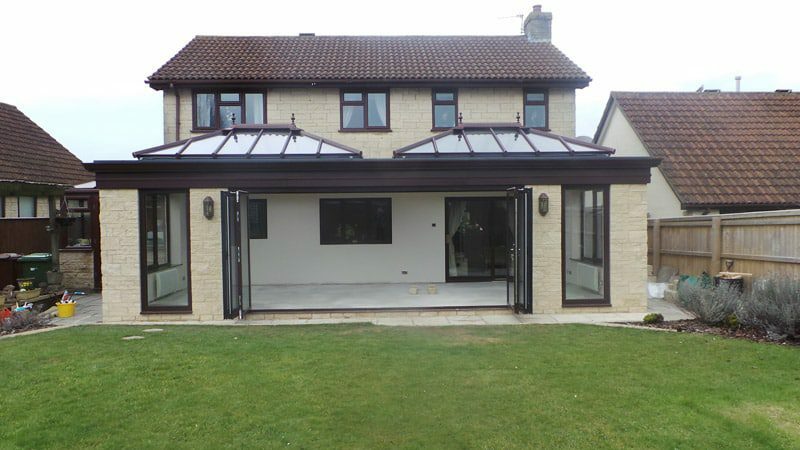 Our quality aluminium bifolding doors give you yet more choice in folding doors. You can design your ideal doors to open in or out, slide to the left or the right as well as both directions depending on the size. We can even design your doors with the invaluable access leaf that enables you to use your doors all year round to gain access to the outside without having to fold all the leaves back. An established tried and tested product. Our new AluK aluminium bifolding door comes from one of the biggest and best known systems companies in the UK. AluK is very well known in the home improvement and commercial sector. Their products are frequently chosen in prestigious developments of flats and houses, in commercial buildings and the world over. It’s one of the best selling doors in the UK, known for its excellent design, great features, quality hardware and value for money. AluK doors offer great thermal performance with style. Our AluK doors are very thermally efficient thanks to modern insulated aluminium profiles. These have a polyamide thermal break to make the frames energy efficient and to work in harmony with our high specification toughened safetey glass. They will not only flood your home with light but will also save you money on your energy bills. All this works together to keep your cool in the summer and warm in the winter. A bifolding door with great security and performance. At Northwest bifolds we provide the best quality glass units as standard. You’ll benefit from toughened glass to BS6206 safety standards, a low emissivity coating to retain heat into the room and deflect heat leaving the room. Also added to our glass is an argon as fill and warm edge spacer bars. As standard you gain a multi point hook lock, anti bump cylinder and stringent testing to Secured By Design and PAS 24. Choose the door to meet your home and requirements. There are two options available on the AluK bifolding door. Our standard door offers all the above features including a great choice of colours, glass, handle and threshold options. For more demanding environments, we offer the heavy duty version of the AluK bifolding door. This is still great for a residential setting but is also ideal for commercial buildings such as cafe’s restaurants or bars. The heavy duty AluK folding door offers even more robust gearing and rollers, improved thermal performance and optional acoustic glass if required. A wide choice of colours available. Whatever door you choose you can enjoy an unlimited colour choice. Your new bifolding door can be finished in over 200 RAL colours. You can even choose contemporary metallic finishes as well as different colours inside and out. All come with long guarantees on paint quality, finish and durability. Contact us today, for prices and further information about our market leading aluminium bifolding doors for your home.